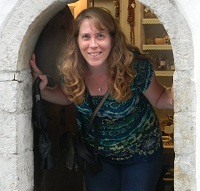 Doorway to a wood button shop in Tallinn, Estonia. In the summer of 2008, my aunt convinced me to join her at Tom Knisely’s weeklong Beginning Weaving class at The Mannings in East Berlin, PA (R.I.P.) as a break from caring for my two young children. Since I didn’t have a loom or the space and money to obtain one, I was just exploring my interest in textiles and having some quality time with my aunt. Halfway through the class, I thought to myself, ‘This is really not for me!’. The amount of knowledge required just to get started, the sometimes-grueling physical work involved (for an already tired mom! ), and the fact that I was the only one in my whole class who didn’t already have a loom and hadn’t already been weaving for some time all conspired to make me feel clumsy and slow. In the beginning of the class, we were weaving towels and a sampler on pre-warped looms. By the end of the week, however, we planned, shopped for yarn, warped and wove our own scarves, and I was starting to change my mind. Learning how to choose my own colors, fibers and pattern, as well as setting up the loom myself, made me love weaving! My aunt had already sent her rigid heddle loom to me, and it was still in the basement when she arrived for the weaving class. We got it out and set it up, and while it was fun to play around on after the weaving class was over and my aunt had gone home, I preferred the speed and design opportunities available with the floor looms on which I had learned to weave. I probably would not have gotten past the dabbling stage, except that one day an enormous box was delivered to my door by UPS. My aunt had purchased a new loom for herself during the class at the Mannings, and she had mailed (!) her old one to me from Kansas. It’s a 1960’s-era Dorset loom made by F. C. Wood with 4 harnesses and a direct tie-up to 4 treadles. It has a weaving width of about 19″ and folds for storage or transport. It also has a lovely walnut finish! On this loom, I began weaving things using my knitting yarn stash. Within a few months I had sold my first scarves and realized I could continue to sell my weaving at the same time I was learning and becoming more accomplished. By 2012, I had three floor looms in what used to be a dining room and sold my textiles at several shows throughout the year in Pennsylvania and New Jersey. 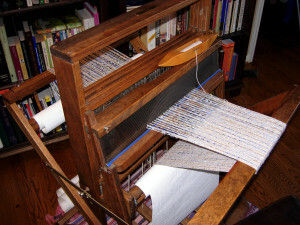 My other two looms had both been purchased used and came with each weaver’s complete collection of books and magazines, and between those and the vast amount of information on the internet, I had ample material for study and inspiration. I also continued to take as many classes as time and money allowed at the Mannings, both to further my education and also for the opportunities to meet and talk with other weavers. I started to develop an academic interest in rag weaving, and in particular the Japanese technique of sakiori, which produces fabric mainly for garments using rag weft. The idea of weaving rags to make clothing fascinated me, in part because it is such a different idea of rag weaving than existed in America or Europe. The Japanese used cotton rags for their sakiori because it was the best fabric they could get to stay warm and protected from the elements, though they couldn’t afford to buy yardage or even used clothing. I wondered what the ‘best’ fabric was in our society that was being discarded, and what could be made with it. I began researching and sampling and in 2013 launched Western Sakiori, starting a blog and teaching workshops. I have since published several articles in Handwoven magazine, guest posted on Weaving Today, and taught and spoken about sakiori. I am currently finishing work on a Western Sakiori book, scheduled for publication in 2018. I was driving my kids somewhere in 2008 when my son dropped his cup on the floor behind me. At a stoplight I reached back to pick it up and suffered a huge muscle spasm from my neck down into my back that took days to relax to manageable levels. At that point, I resolved to do something about my physical condition. I signed up for the Movement Arts Institute Tai Chi class held at a local community center taught by head instructor Andrew Baker. I had good reason to react the way I did to that one muscle spasm, which many people may have ignored after the pain faded. When I was a junior in college, I was struck by a car as a pedestrian. I was fortunate not to break any bones or hit my head, but I did have severe whiplash in both my neck and spine. I was in three times per week physical therapy for about a year and spent most of that time in some degree of pain, sometimes better, sometimes worse. I was told never to go running again (I was an avid runner) because the damage to my back included herniated discs that could rupture. Basically, at 20 years old, I had the back of someone in their 40s. I was able to continue exercising on low-impact machines, and, mostly, I was in pretty good shape and had less pain than I was expecting given my injuries. At 29, I had my first child, and like many new moms, I ignored my own needs in favor of caring for my baby. I did manage to resume regular exercise when my daughter was older and we moved. Our new neighborhood had a YMCA with childcare that was convenient and affordable. Then I became pregnant with my second child. It was a difficult pregnancy and I rarely felt up for the activities of daily life, much less going to the gym. Just after the birth, we moved to central Pennsylvania. I continued to have poor health for several years, until a diagnosis was finally made, treatment could begin and I could start to recover. With my youngest child starting preschool, it was also convenient to return to the gym. Around this time, the above incident occurred and I also started practicing Tai Chi. The Tai Chi classes didn’t feel strenuous. I didn’t have pain afterwards. Yet, little by little I could feel dramatic improvements in my body, both in strength and flexibility, and finally, in the way I moved. Tai Chi teaches you to move the majority of the workload of any given task to the large, strong muscles in your core, rather than in the arms, shoulders or back. It also teaches you to keep your muscles relaxed until you need them, so that you aren’t carrying tension in your body that leads to injury and pain. I can finally say that I rarely have pain from my old injuries. I can perform tasks that usually cause people pain, such as raking leaves or shoveling snow, without feeling it later — at all. 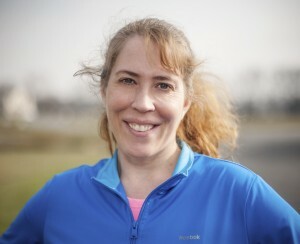 In 2012 I began teacher training, becoming a certified instructor in the MAI (which had recently had their seniors’ program approved by the Agency on Aging in their Title IIID program as an evidence-based program), and in January 2013 I began teaching my first class at an active senior community. I continued teaching there, adding another class that fall, as well as teaching some classes at a community senior center and assisting Andrew in the class I was enrolled in. As I continued practicing Tai Chi and continued weaving, I began noticing strong connections between the two activities. Weaving is intensely physical and in the classes I have taken over the years, pain is a major topic of class chitchat. Some weavers have injuries or problem areas that make certain motions more difficult, and some just experience the same repetitive stress injuries from weaving that can happen in any activity. Weaving requires movements that can be performed at a distal level, mainly involving the arms, shoulders, and legs, but could just as easily be done the Tai Chi way, transferring the majority of the movement’s energy to the core and alleviating the strain on weaker areas. I began applying Tai Chi principles to my own weaving, and became excited about sharing what I found with other weavers. With Andrew Baker’s generous sharing of his class curricula and his assistance and support, I developed Tai Chi 4 Weavers as a seminar class that I could share with weaving schools, guilds and conferences. I am available to teach seminars at your location, and a DVD will be filmed in late 2017.